Here we go. In some ways I might call this an intro into the large war breaking out. We’ve gotten scenes showing what the various characters are up to, but not spending too much time in any one place. They did make clear how powerful Vlad is however. 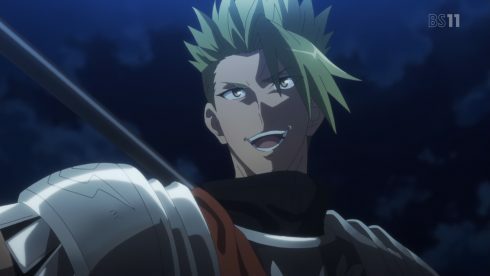 That guy is a beast and no doubt will be tough for any one servant to bring down. One interesting thing this episode did was make me fear for Berserker. I mean we’re talking about a servant coming into conflict with a Master. There should be zero chance of anything bad happening there. And yet…I can’t help thinking she is in deep trouble. 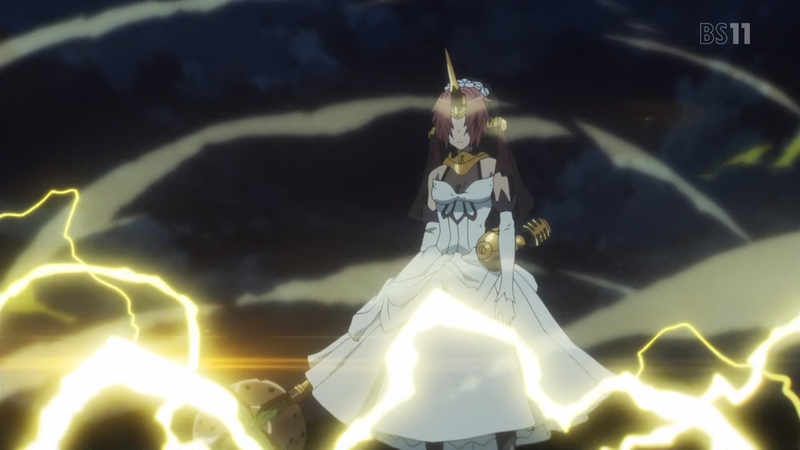 Maybe it is because she isn’t the most impressive Berserker or maybe because that priest seems to be downright insane. I mean wow…this guy is gone. He just takes obsessive belief to another level. Plus he’s one of the more dangerous kinds of religious fanatics. Clearly he will just go around doing whatever he wants and consider it divine approval if things go well. He is pushing the limit just to see what will happen. In a sense he is far crazier than a Berserker servant. I just get the feeling with the foreshadowing and how the episode played out that this could go rather badly. Things aren’t entirely hopeless though. 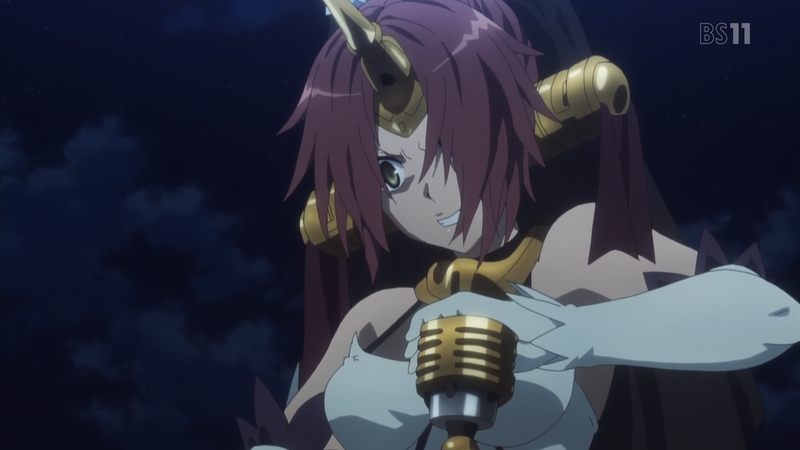 Berserker is being observed as she goes about fighting. If things start to go badly I’d presume her master to be rational enough to pull her back. Even if it means using a command seal to teleport her back to him that should be an option. 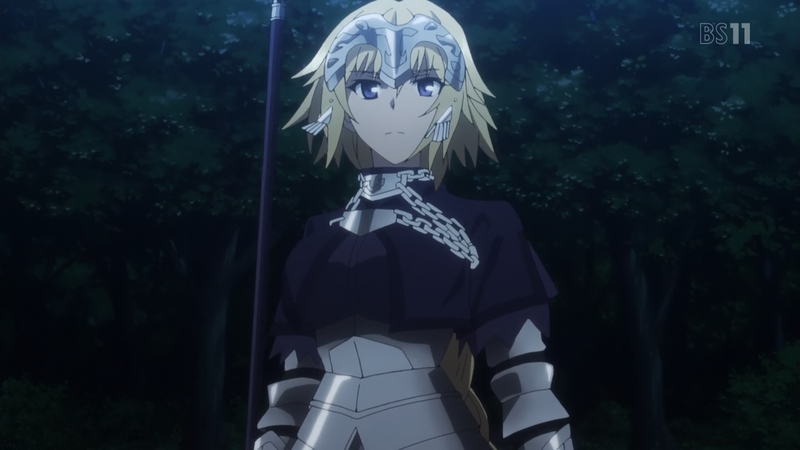 In terms of divinely guided characters we already know what Jeanne is doing. No shock that this floating fortress and the skeletal army is treating her as a hostile. Not sure it is a good move to continue giving her evidence that the Red Faction is up to no good, but such is. The question is whether she will be able to make her way to the priest or make her way up to the fortress itself. That isn’t going to be easy with how strong the defense is and how numerous the defenders are. I will say that facing that defense with courage just makes me all the more a fan of Astolfo. He knows how dangerous things are and yet won’t go to the level of using his noble phantasm. His mount is a gas guzzler type and going all out would certainly drain the homunculi and send some closer to death. 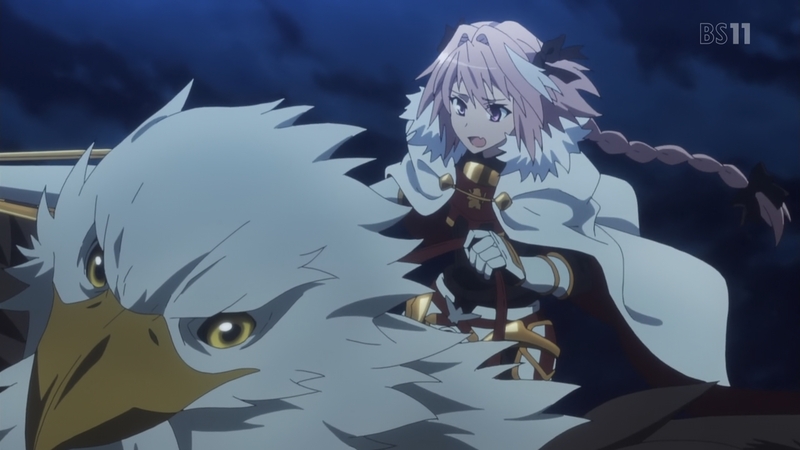 No doubt his master is pissed, but I love the heroic nature of Astolfo. Some servants are more likable and honorable than others. I can’t imagine with that crummy master that Astolfo will make it to the end of this fight, but I hope he makes it pretty far. The emotional clash of heroic spirits can be felt most clearly with Achilles vs Chiron. No doubt Chiron is right about Achilles. He is a bold and intense attacker when he feels he is facing enemies. There is no doubt in his actions and his assault is intense. But he is the type that hesitates hard when facing enemies he respects or considers a friend. It will be hard for him to fight against Chiron. This is his precious teacher who taught him so much. An incredibly dangerous matchup since Chiron knows his weaknesses the best. While Chiron talks about Achilles being soft….so is he. Instead of lecturing or telling him how to respond to this situation he should have continued coldly attacking. If he’s purely in this war to win then there is no reason to give Achilles the chance to regain his footing and fight back. And of course we know what Sieg is up to. I respect the guy for going around an active battlefield and trying to achieve his goals. He just wants to save as many homunculi as he can. Although there is little he can do to save them since they are basically slaves and have limited lifespans. Now I could at least imagine why he’ll come into conflict with the Red Faction. They consider the homunculi enemy fighters and see no reason to avoid killing them. That is no different for Sisigo than the priest himself. And they may not be wrong considering they are fighting. 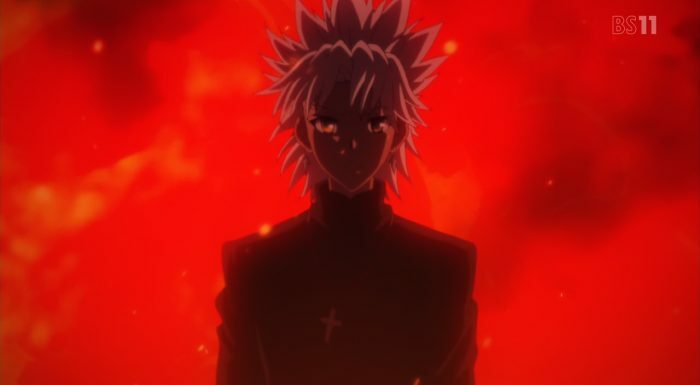 But, if Sieg tries to protect them and comes under attack…that might force him to tap into Siegfried’s power somehow. The battlefield has gotten chaotic and the episode set things up nicely. We should continue seeing the various characters clashing as this battle goes on. Caster has inflicted the turned Spartacus onto the battlefield which will make things dangerous. We don’t know how the priest vs Frankenstein’s monster will turn out either. Just a variety of matchups and battles are being fought at this moment. This wasn’t the best episode of the series but I enjoyed it. I’m looking forward to seeing what happens. 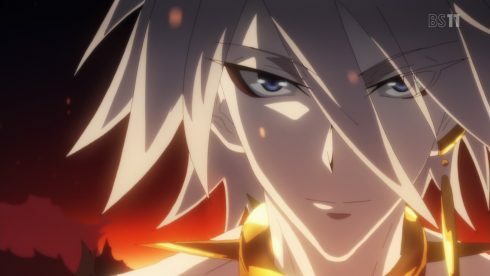 Can Karna match up against Vlad? How will Jeanne’s actions impact the battlefield? Will Mordred crash that car? I have no idea, but it should be fun to find out.